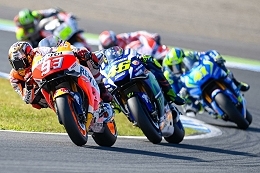 TATA is exclusive video distribution partner for the FIM MotoGP™ World Championship. London, February 2017: Tata Communications has been selected by Dorna Sports as the exclusive video distribution partner for the FIM MotoGP™ World Championship and Superbike World Championship (WorldSBK). Tata Communications will distribute the motorcycle road racing action from five continents to over 80 media partners, reaching over 200 million households, using its global superfast fibre and satellite network. This partnership will enable Dorna to capitalise on the opportunities that the latest digital technology advancements bring, as people’s evolving content consumption habits continue to shape the sports industry. As part of the new partnership, Tata Communications and Dorna will collaborate on several innovation projects involving technologies such as low-latency Ultra-High Definition (UHD), 360º and live OTT video feeds, as well as remote production and High-Dynamic-Range (HDR) imaging, enabled by Tata Communications’ Media Ecosystem. This ecosystem, including the Video Connect service, combines traditional video contribution services and IP connectivity in a global cloud-based platform. It will allow Dorna to manage and distribute MotoGP™ and WorldSBK video feeds from any location to any device in perfect synchronicity. By eliminating the common lag with OTT content delivery, Tata Communications’ Media Ecosystem ensures a truly real-time and interactive race experience for fans, whether they are watching the action on TV or a mobile device. To ensure a seamless viewing experience regardless of location, and bring fans high-quality racing content across different platforms, Tata Communications will connect each of the 18 MotoGP™ locations using its global superfast network, and double the network capacity currently available to Dorna. This bandwidth boost will ensure the reliable distribution of live video feeds, consisting of footage from the track and 360º on-board cameras as well as commentary, on a global scale. It will also enable Dorna to handle many of its broadcast operations remotely from a newly-built media hub in Barcelona, Spain. Dorna’s media partners producing live programmes from the circuits will also use Tata Communications’ network for global video delivery. Tata Communications’ media, cloud and connectivity services are underpinned by the world’s largest subsea fibre network of its kind, creating a fully-converged, end-to-end solution for Dorna.